Wright State students in the women’s studies program will be getting a visitor to their lectures this week, and the general public will be treated to a thought-provoking address. 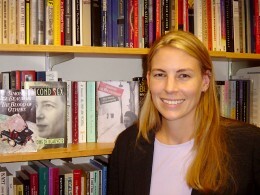 Jennifer McWeeny, Ph.D., will be visiting campus through the Women’s Center’s scholar-in-residence program. McWeeny is an associate professor of philosophy at John Carroll University, where she specializes in several disciplines including feminist philosophy. While she is at Wright State, she will meet with women’s studies students and faculty and give several presentations. On Thursday afternoon, March 8, McWeeny will lead a reading group focused on her article “Liberating Anger, Embodying Knowledge: A Comparative Study of María Lugones and Zen Master Hakuin.” This event will take place in 182 Millett from 12:30 to 1:30 p.m.
Thursday evening, McWeeny will give her keynote address, “The Reversible Flesh of Women and Nonhuman Animals: Rethinking Connection and Difference in Feminist Theory.” This address will focus on portrayals and experiences of women and animals in Toni Morrison’s novel Beloved. “She’s written this lecture to be accessible to all people, regardless of what their background is,” said Amber Vlasnik, director of the Women’s Center. Prior knowledge of women’s studies, philosophy and the novel are not required. The keynote address will take place in the Millett atrium at 4:15 p.m.
On Friday, March 9, McWeeny will lead a workshop on embodied pedagogy. Drawing on methods derived from Gestalt therapy, phenomenology, embodied cognition theory, decolonial theory and feminist consciousness-raising practices, McWeeny will model key aspects of embodied pedagogy for participants and organize exercises that invite the participants to try out these techniques themselves. The workshop will take place in 036 Rike Hall from 11 a.m. to 2 p.m.. Registration is required for the reading group and the workshop. The keynote address is open to the public. To register for the reading group or workshop, contact the Women’s Center at (937) 775-4524.